This website is a personal historical project that was first started on January 2006. Currently this is the only website on the internet specifically researching and documenting the historical WW2 defences at Pengerang in Johore. 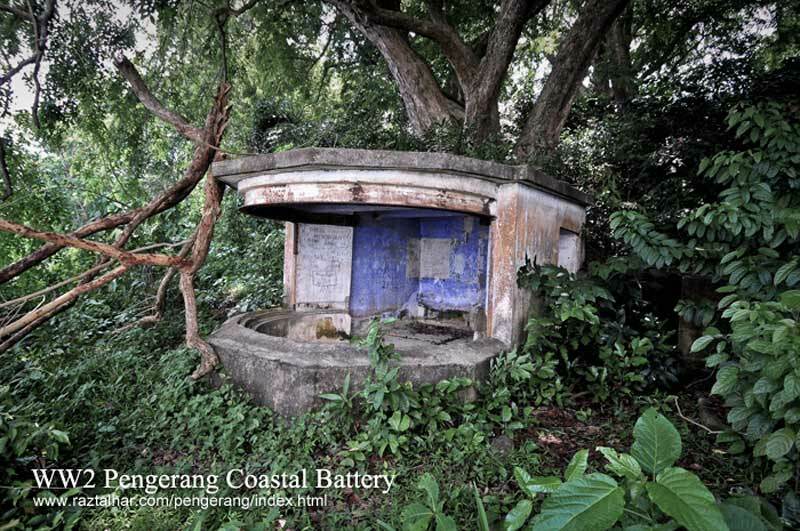 During WW2, the Pengerang battery was part of Singapore's defences defending the eastern approach to the Royal Naval base at Sembawang. From what I have found out so far, it seems the battery did not come under direct attack during Singapore's fall. What's interesting to note, was that Pengerang must have been one of the last British military footholds held on the Malayan mainland right up to their surrender on 15th February 1942. Today, a high proportion of the land that the WW2 facility once occupied is now taken up by KD Pularek, a naval training academy - this means that a great deal of the former battery is off limits to the public. To date I have made several trips to Tg Pengelih to study of what remains of the defences located there. On each trip I have done, I have found something new. As you can imagine the area is very overgrown and hard to properly study by one person alone. As of yet, I have been unable to locate any period construction plans of any part of the battery, so cannot be sure of its true extent. Thanks goes to the fellow historians I have met on the internet and for their sharing of information. Much of this website would not be possible without their generosity and love of history.